Happy Belated National Pencil Day! It was yesterday, March 30th and a fitting tribute to a lot of pencils I’ve sharpened over the last three months.Whew! It’s really been a busy spring here at the studio and at my house. 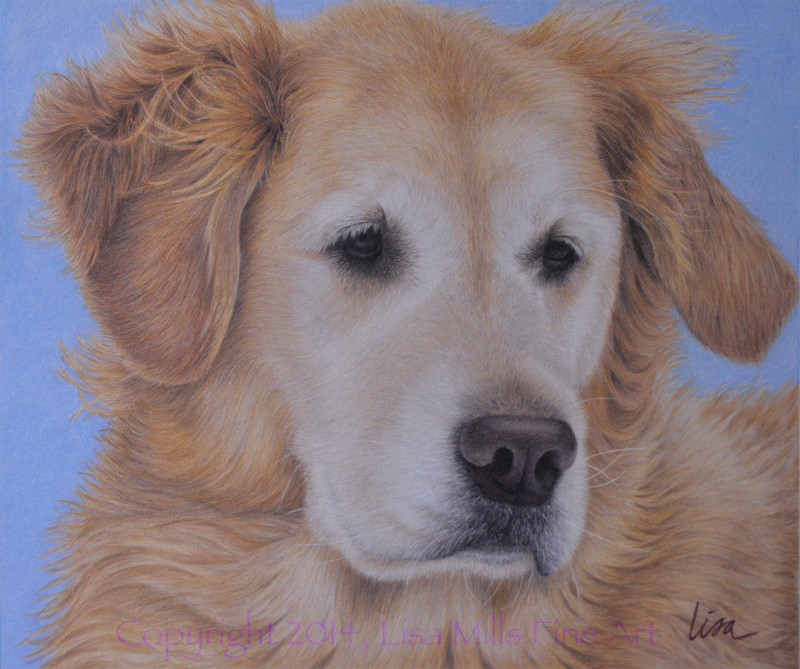 As you may recall, last November, we lost our beloved Golden Retriever, Lucy. We still had our other Golden, Gracie, who took the loss hard herself. In January, we welcomed 8-week old Bailey to our family. Also a Golden Retriever, she’s been a sweet addition and is a really good dog – especially for a puppy. She’s about 4-1/2 months old now and growing fast. As you can imagine, puppies do take a bunch of your time and this one is no exception, but she’s been a delight. Right after Lucy died, I set about trying to create an appropriate tribute to her. I found a photo of her from a snowy day a couple of years back. She had such a captive expression on her face that I decided to use the photo to create a memorial portrait of her. This is A Requiem for Lucy. It’s done in 100% colored pencil on my favorite Art Spectrum Colourfix Suede paper. I’ve entered it and Reflections on Cool Jazz in the 22nd CPSA International Exhibition. The first round of judging is in a couple of weeks – we’ll see if either of these pieces are worthy of acceptance into this show. If one of them is accepted, I will receive CPSA signature status this year, so I’ve really got my fingers crossed. The other thing that has kept me busy is that I have authored and illustrated a detailed step-by-step tutorial available to purchase on my website. You can see it in my previous post. It was also the subject of a workshop I conducted for my local CPSA chapter here in the Dallas/Fort Worth area earlier this month. It was my first workshop and I think it went pretty well. I had lots of positive feedback and a great group of students. It’s a little intimidating teaching award-winning artists in a workshop!